This week marks the first post in a series of photography tips which will be featured on the Images from Neil Corman Photography blog. In our first post we will dive right in and look into creativity, which is not a small area at all. There are many ways to use creativity whether it is for a specific assignment, client requirement or just out shooting on your own. This entry will look at the last of those and when you are shooting for yourself to express your own vision or capture something you think is interesting. I know in talking to photographers as well as in my own experience there are many times you get to a spot and find yourself not inspired with the surroundings but know there is the possibility for something to come from the location. Those familiar with Fort Missoula (probably most people who have been in Missoula for a RMSP class know it well) know it is a place where there is a bunch of variety but sometimes just difficult. Last fall I found myself at Fort Missoula on a nice crisp morning. At first I headed out to capture some fall like scenes around the building with some morning light still providing an interesting scene. 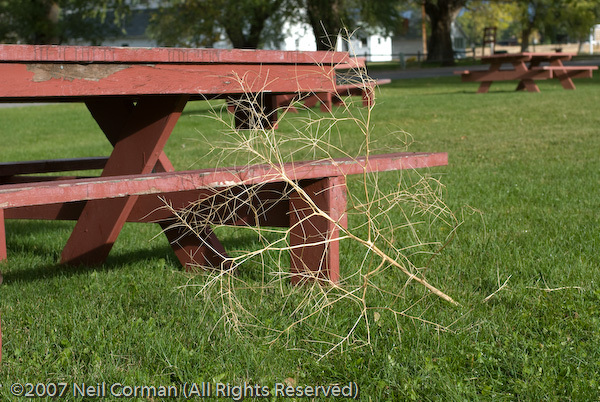 As I knew this would be most likely be the last time I was at Fort Missoula before driving back to Denver, I took one last walk around the grounds and noticed near the garden a tumbleweed. Now there is a reason why I took this picture, and it is a running joke with a photographer friend of mine who photographed tumbleweeds while in Montana. It isn’t a surprise her blog is titled the tumbleweed . Once I took this image I started looking around and wondered if there was an image in the area which I could take. Looking at the angles and background I found myself standing on a picnic table. I wasn’t sure if a pattern was there but it just didn’t get me excited so I continued to look some more. To look some more I needed to get down from the picnic table. I decided to change my f-stop to f /22 let less light come into the digital sensor thus requiring a longer shutter speed. This change gave me a 1/15 of a second exposure, and with a gentle jump I clicked the shutter. 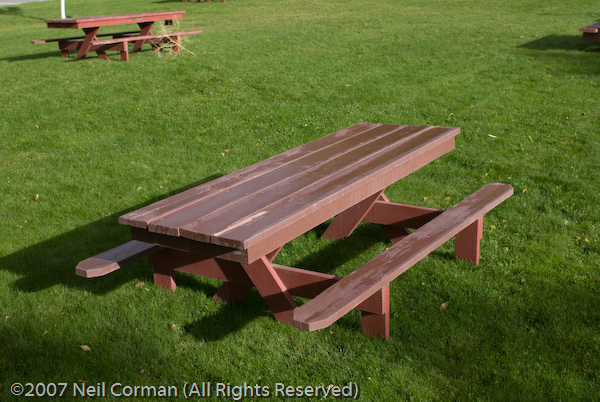 One word of caution on this, be careful at the edge of a picnic table as they can shift depending on the weight placed on one side. As you notice above I started getting some motion as I was traveling faster than 1/15 of a second. I’m sure there is a whole process to figure that all out, but I will leave the calculation for others at this time. Looking at the LCD I decided this could be something to explore. 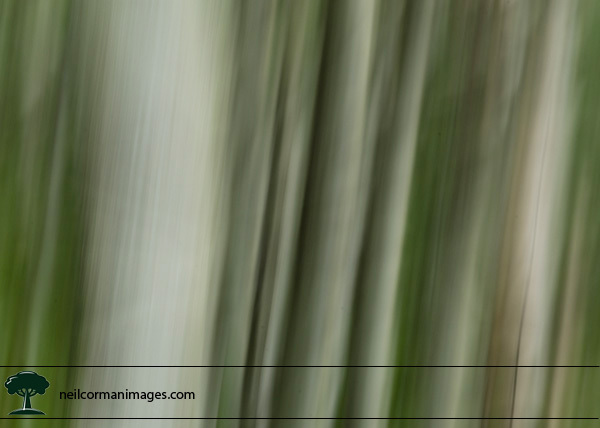 The lines of the trees are starting to show and the movement gives an interesting feel to the trees. The problem is the trees are quite a distance away in the image, which was shot at 35mm. I decided to give it another try and this time got up on the seating portion of the table since the 1/15 shutter speed would be more faster than the time it took for me to reach the ground. As the trees are in the distance I also zoomed in to 58mm to bring them closer as well. 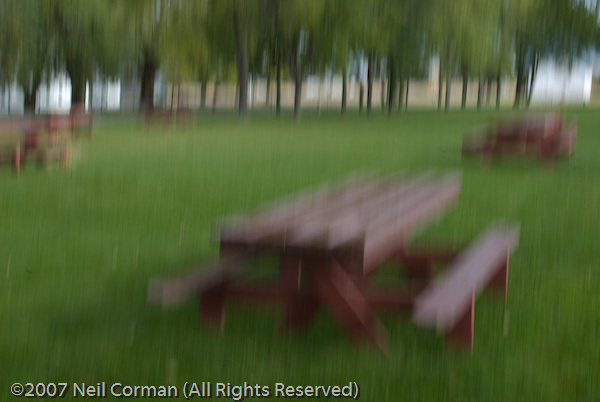 In this final image you can also see I also slightly changed my perspective to get two picnic tables lined up since the lines of the table I thought could add to the linear element of the photograph. 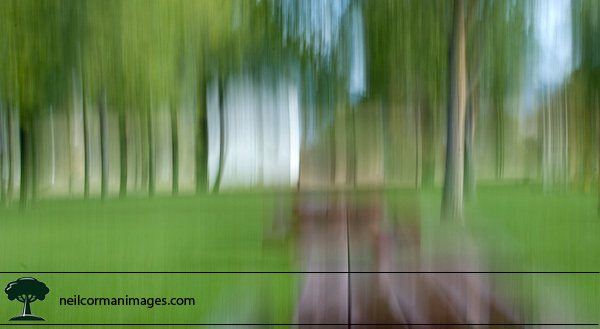 In this example I used an elevated bench to allow me to add some motion, but this is not always needed. It is possible to get a similar effect by just tilting the camera quickly up and down. The whole process of creating a look like this takes practice and more so patience, so I recommend experimenting in different areas to find something which gives a look you like. One advantage of using a digital camera is being able to see the immediate results. Also if you use a point and shoot it is possible to create these types of images, but it will require even more patience since there is sometimes a delay when pressing the shutter. Be sure to post a link to some creative images you take while experimenting and I look forward to seeing some of the creative images you come up with in the next few weeks.